This waterfront house plan is compact, with open living areas and secluded private rooms. 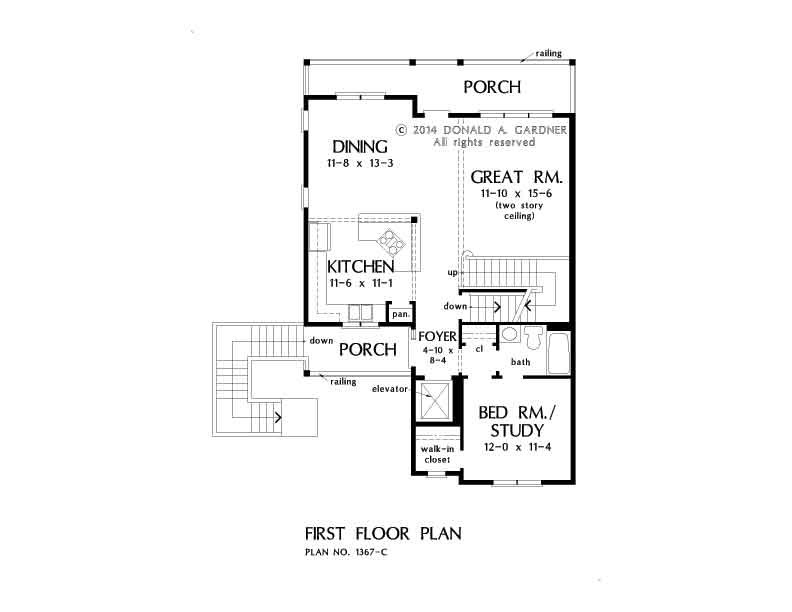 Conversation flows easily from the two-story great room with open stair case to the kitchen and dining room. The bedroom/study has a walk-in closet and bathroom access. 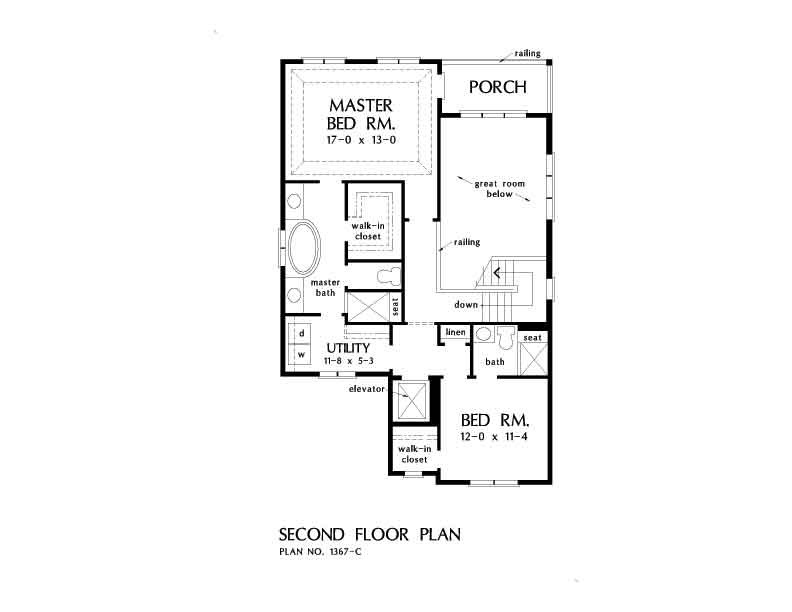 Upstairs, the master suite and secondary bedroom meet at a convenient walk-through utility room. An island basement provides storage and parking space, while a home elevator makes it easy to move between floors in this house plan. 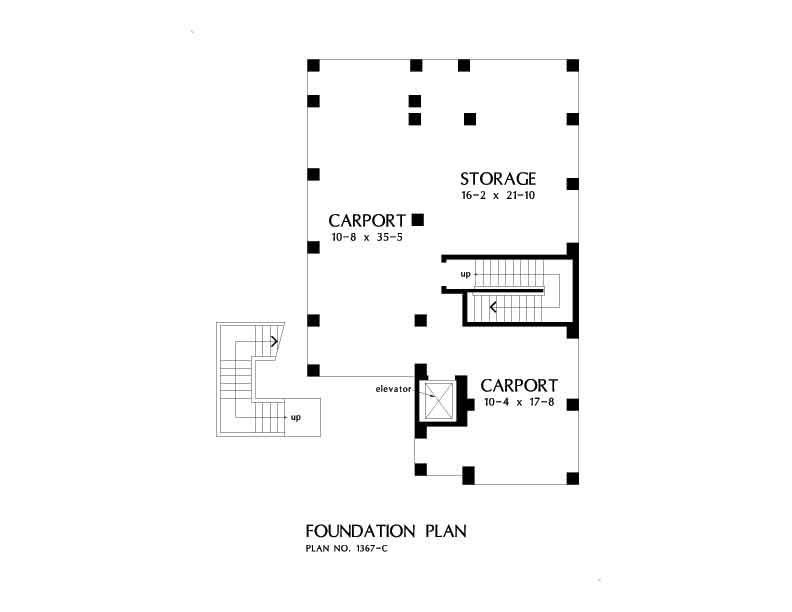 1st Floor: 1026 Sq. Ft.
Porch - Front: 67 Sq. Ft.
Porch - Rear: 157 Sq. Ft.
Porch - Rear Upper: 74 Sq. Ft.
House Dimensions: 30' 4" x 47' 6"
Great Room: 11' 10" x 15' 6"
Elevator (Flat): 4' 2" x 4' 8" x 0' 0"
Foyer (Flat): 4' 10" x 8' 4" x 9' 0"
Dining Room (Flat): 11' 8" x 13' 3" x 9' 0"
Great Room (2 Story): 11' 10" x 15' 6" x 18' 0"
Kitchen (Flat): 11' 6" x 11' 1" x 9' 0"
Garage #2 (Flat): 10' 4" x 17' 8" x 11' 4"
Utility Room (Flat): 11' 8" x 5' 3" x 8' 0"
Garage (Flat): 10' 8" x 35' 5" x 11' 4"
Garage Storage (Flat): 16' 2" x 21' 10" x 11' 4"
Master Bedroom (Tray): 17' 0" x 13' 0" x 9' 6"
Bedroom / Study (Flat): 12' 0" x 11' 4" x 9' 0"
Bedroom #3 (Flat): 12' 0" x 11' 4" x 8' 0"
Porch - Front (Flat): 12' 0" x 5' 7" x 9' 0"
Porch - Rear (Flat): 30' 4" x 4' 0" x 9' 2"
Porch - Rear Upper (Flat): 12' 4" x 6' 0" x 8' 0"